As a PhD student within Engineering, you will become an expert in your own field of research at one of the largest and most diverse engineering, environmental science and audiology faculties in the UK. As well as being a member of the prestigious Russell Group the University of Southampton is the most powerful University for general engineering research in the UK (REF 2014). If you have an upper second class or first class degree in engineering, you are eligible for our PhD programme. Within the four years of the programme you will be conducting original research for your thesis, publishing papers and presenting your research to the academic community. But it’s not just about gaining your PhD, we want you to invest in your research career. That's why our programme ensures you benefit from both technical and personal training as well as development through placements in industry, mentoring, conference attendance and technical courses. Our scope extends well beyond the boundaries of the University with a comprehensive outreach and engagement programme so your research can reach the wider community. Change the world for the better on one of our PhD projects. As a PhD student you will be the expert but you won’t be working alone. Each student has a team of academic supervisors - experts in their field – who are on hand to guide the research and provide advice and support. Most of our research projects have strong links with industry enabling you to conduct experiments at a variety of facilities and ensuring your research is current and relevant with a real world impact. You will be joining a thriving postgraduate community at the University. With over five hundred PhD students in engineering there is no shortage of new friends to make, clubs to join and experience to be had. Whatever your background we have a PhD course that's right for you. There are three different courses you can choose from to get your PhD and choosing the right one often depends upon your background and previous study. 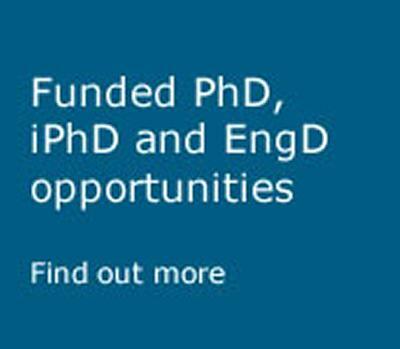 If you have completed your undergraduate and masters degrees and you would like to continue working in the same field then the PhD is probably right for you. If you are coming straight from a Bachelors degree or changing field of study then you will more than likely want to check out our Intergrated PhD (IPhD) or Engineering Doctorate (EngD) programme. Both our IPhD and EngD include integrated training years comparable to a masters degree. You can find out more about each programme by clicking on the links below. Research at Southampton has been judged the most “powerful” in the UK in the UK Government’s latest assessment (REF, 2014). Each year our research changes the world for better and we look forward to welcoming you to the team. Everything you need to know about applying for our Postgraduate Programmes & Research Degrees within Engineering at the University of Southampton.